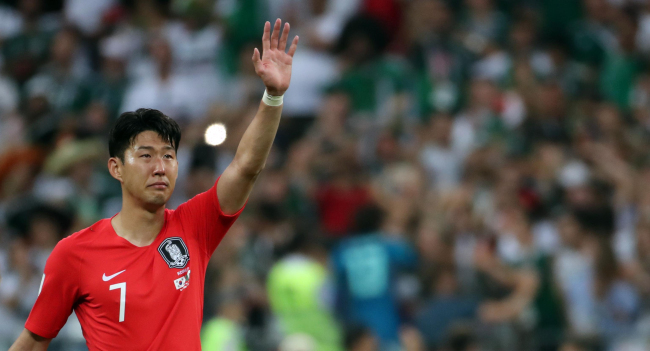 [World Cup] Can Son Heung-min earn pass on military service? Online soccer platform Onefootball said Tuesday that there had been hopes for South Korean soccer players to be exempted from military service should they advance to the quarterfinals or further at the World Cup. A number of newspapers touched on Son Heung-min’s struggles to avoid military service upon discussing South Korea’s upcoming match against defending champion Germany on Wednesday. As the speculation circulated, soccer media news publisher 101 Great Goals countered, saying the World Cup has “no impact” on the Korean superstar’s military commitments. The South Korean squad for the 2002 FIFA World Cup was exempted from military conscription in recognition for reaching the semifinals. However, as controversy has been sparked by such exceptions, the state came to the conclusion in 2007 to hand military exemptions to those who win any medal in the Olympics or a gold medal in the Asiad. It is likely that Son’s destiny will be decided following the upcoming 2018 Summer Asian Games in Jakarta-Palembang, Indonesia. He can earn a pass on military service with a gold medal at the event. If the Tottenham Hot Spur attacker is able to avoid his mandatory conscription, his market value is expected to shoot up by a large margin.